I had a feeling it would be "The Destruction of Empire". Sadly appropriate. Was this the picture you said you'd use if things became hopelessly bad? Well if he's giving up the fight you can't hold it against him. Chris has battled harder than most people do their entire lives. He's used the blog to make people think as best he could. This world is in the hands of lunatics and thieves.. The economy has been destroyed. One man can only do so much. Chris if you're still reading this, you've done everything you could with the voice God gave you. I like how you went after Ron Price and that nut case Johnny Robertson especially. Don't go too far I think this world still needs you. DOW crashed close to 700 points down today. Apparently, a lot of the people that read this are teenagers. I hope that's the explanation anyway. There is a real world out there you know. Internet only provides so much security then you have to face reality. Cut off your computers for a while and see what it is like out there. Hmm... I wonder who posted those last three comments? What Does the Internet Say? This Internut says Ron Price or Johnny Robertson made the comments. If the comments weren't here I wouldn't be as convinced that Christopher made this post on Tuesday. Look what happened since then. This was the all time worst week for the stock market. And now many governments are thinking about stopping trading and nationalizing their banks. 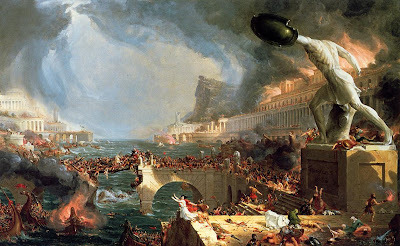 Before all of it started to happen Christopher used Thomas Cole's The Course Of Empire: Destruction. That was prophetic if you ask me. I hope that, finally, some peace has returned to your life. May the Lord of all Mercy heal your troubled soul and restore that which you have lost.